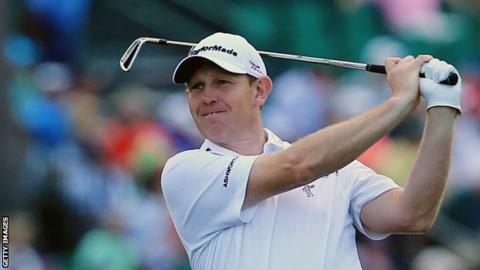 Stephen Gallacher enjoyed his first taste of the Masters and is eager to make sure he gets back to Augusta. The 39-year-old Scot closed with a round of 70 on Sunday to finish in a tie for 34th place on six over par, having seen his challenge falter with a ragged 81 on Saturday. "It was all I expected and more," he enthused. "I think it's brilliant. "It's tough to get in, so once you get in, you've got to enjoy it. It makes you want to come back." The West Lothian golfer opened with rounds of 71 and 72 to tee off the weekend in a share of 10th place. However, Saturday proved a tough day as he plummeted down the leaderboard. "I played good all week really," Gallacher explained after his final round. "Just a slight mishap yesterday but felt as though I played good all week. I drove it well and putted a bit better today, that was the difference. "I've loved it. It's been brilliant to play. Three rounds of 72 and under is not bad as your first experience. Just a bit ropey with the putter yesterday and hit a few poor shots from the fairways, but on the whole I loved it. "I had a great week with some family and friends, although I think my credit card got hit in the merchandise tent. I've got enough friends at home that there's going to be plenty of green Augusta stuff back home anyway." Gallacher now sits at 39th in the world rankings and ninth in the European Tour Race to Dubai, having successfully defended his Dubai Desert Classic in February and finishing sixth at the WGC Cadillac Championship in Florida in March. "I wasn't as nervous as I thought I was going to be," he added on his Masters debut. "I was just kind of enjoying it and just kind of going with the flow. "I think, when you've watched on TV for that long, you kind of know where you want to hit it. It's just a case of actually doing it." In contrast, fellow Scot Sandy Lyle was playing his 100th Masters round on Sunday, the 56-year-old shooting 73 to finish 10 places behind Gallacher. The 1988 champion's Sunday scorecard included an eagle at the par-five 13th hole. "For me, it doesn't get any easier physically," he said. "Around here (pointing to his head), I still feel about 56, but down there (pointing to his feet), I'm about 80 at the moment. "My legs are sort of hanging in there, that's when it gets to you is your physical, mental side that can fade away, if you're not careful. You got to have lots of liquids out there." Bubba Watson finished three shots clear of the field to win his second Green Jacket in three years on a total of eight under par.